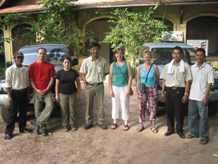 "what you need to know.."
Exciting, all-inclusive four-wheel, air conditioned tours to locations outside of Siem Reap. Guests can tailor such as adding walking, trekking and humanitarian activities into any of them. Especially popular are tours that include our own jungle lodge in Koh Ker, our homestays in Preah Khan Temple, Preah Vihear, Banteay Chmmar and the lake . Guest houses are nearly everywhere now and even boutique hotels, so all can be tailored and worked in to suit. Guests can travel to all locations by 4wd and larger groups by bus. A few routes to all locations exist so again, all can be tailored. Note: For tours 1 to 4, groups of more than 5-30 can travel by bus. For camping setup and security overnight, add $100 and for lake add $15 for permissions and security. $1, 080 or $270 ea. 6A* Beng Melea & Koh Ker Temples with Kulen Mountain 3 days 2 nights Camping Beng Melea & Koh Ker Eco Lodge $750 $990 or $475 ea. $1, 520 or $390 ea. $1, 560 or $780 ea. Hidden Cambodia can purpose built a trip for you to any part of the country. * Please note with camping in Tents in 3*, 6* and 11, an additional charge of $60 for security is required and $60 for set up for that one night and shared amongst the group. Inclusive of an experienced driver and 4WD air conditioned vehicle, (Monterro or Pajero vehicle) and is some cases minibus for groups, all transport costs and transfers, refreshments in Hidden Cambodia base prior to and following the adventure tour, entry to various specific temples, heritage sites and attractions along the route as specified in the itinerary, English speaking HC Guide, local guides where necessary, baggage handlers, additional vehicles or others where required, any local fees such as road charges toils & levies, local and tourist police, military and security escorts when required. Inclusive of food, snacks, water and accommodation for the duration of the tour. A 4-day tour includes 3 breakfasts, 4 lunches and 3 dinners and 3 night’s accommodation. Every effort is made to ensure accommodation the best available at the time. Single accommodation available for a small supplement in hotel locations. Alcoholic beverages, mixed or soft drinks, hotel incidentals such as phone calls or laundry & travel protection insurance. Vehicle: Powerful air - conditioned 4WD vehicles. If there is a large number of guests, we may advise an additional support vehicle to accompany to carry extra equipment, luggage etc. In the case of larger groups, we may suggest a minibus where possible. Pre-trip meeting: All those traveling on a tour will meet on their arrival in Siem Reap, at least day and a half day prior to the trip to discuss the route, complete payment and review all aspects of the trip. Price conditions: Prices can vary according to the season. There are no refunds for any unused services of the tour or refunds once the tour has commenced. Tour prices are subject to change without notice. All quoted prices and payment are in US dollars. All tour balance cash payments due are prepaid on arrival in Siem Reap. Booking: Those that travel with us usually plan quiet a bit in advance. Those wishing to conduct special interviews such as journalists, those involved in research, journalists, archeologists, and photographers or those who have special requirements are best advised to detail this in an email and we will do our best to accommodate. Deposits: Deposits are 50% of the total trip. A deposit is received by bank transfer to our Cambodian bank account or PayPal for smaller deposits Remaining payments on arrival are a cash payment in USD. Cancellation Policy: In the event of a tour cancellation, 60 days prior to the departure date, the entire deposit is refundable. Cancellations made less that 60 days prior to departure date will result in the forfeiture of the full reservation deposit. In the event of a cancellation, we are happy to move the same booking to an alternative date if both parties can accommodate a change in dates. Responsibility: Hidden Cambodia Adventure Tours and its partners so not assume responsibility for bodily injury, nor for damage or loss of any personal effects, luggage or personal belongings, personal injury accidents or illness. Hidden Cambodia Adventure Tours reserves the rights to alter the itinerary at any time for the convenient operation of the tour, dates or departure or return, or withdraw the trip if deemed necessary at any time, for any reason. For those of you that are short on time, this tour offers easy road, comfortable travel, low exertion and two excellent destinations. A 7.30am transfer from your hotel to HC base camp and a brief of the tour, guests travel through the Angkor Wat complex north through the countryside, small villages, past local wats and to near Beng Melea temple. Guests continue on to Svay Leu, 15kms away from Beng Melea and 70 km in total from Siem Reap to visit their small market. This marks the last location of a large village and a cross roads market. Beyond this is Hidden Cambodia. Guests start their tour of Koh Ker with the palaces before entering and standing in front of Prasat Thom. Guest can climb the pyramid temple for sunning views of the surrounding countryside. Travel onwards by car the visit Prasat 5 (5 temples), Prasat Chen (Chinese temple) Prasat Kamou (Black temple), Lingapura - City of the lingas, the haunting Elephant temple and host of other before returning to the picnic area for a tasty barbequed lunch. Following lunch, guests travel on to Beng Melea to view this 11th century. This is a very beautiful ruined y temple with overhanging ferns that was used as the hunting lodge of Angkor Wat and also as a resting location for Kings traveling for the old pre-angkorian capital, the Great Preah Khan over 100km away from Beng Melea. Guests arrive back in good time, 5.30pm to 6pm, through Angkor Wat and a welcoming drink back at base. Travel on paved national road to Anlong Veng. Unpaved new road continues all the way to base of Preah Vihear. 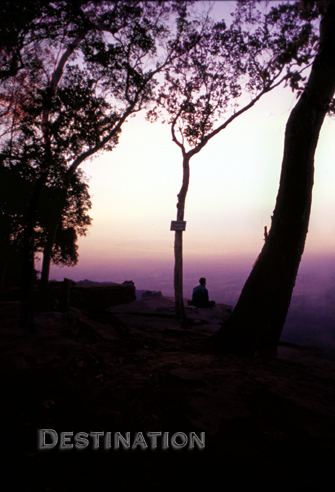 Steep incline to Preah Vihear Mountain and a lesser one to the Dangrek escarpment. Road in good cpondition to Anlong Veng now. For those of you that are short on time, this tour offers a medium challenge road and two excellent destinations. Following a transfer from your hotel to HC base camp and a brief of the tour, guest travel through the Angkor complex north to the small town of Anlong Veng, 130 km north of Siem Reap. The beautiful Dangrek escarpment, 16kms further and part of the Dangrek mountain range, provides a natural border between Thailand and Cambodia. This town and area was the last stronghold of the Khmer Rouge. Enjoy an excellent lunch in the town before driving up the escarpment. Pol Pot lived here during his last years and died in his jungle hide out on the mountain in 1998. Tour of the mountain, Pol Pots grave and bunker and the remains of the house he was tried in, visit with local people, dinner and over night in a spectacular mountain camp in comfortable wooden bungalows. Following a hearty breakfast and a tour of Ta Mok’s villa in the town, continue east to Preah Vihear temple, a stunning temple located on a mountaintop, overlooking Thailand and Cambodia. The 120km journey passes through Kulen Prum Tep Wildlife Sanctuary on a newly constructed road to the base of this isolated temple in the sky. 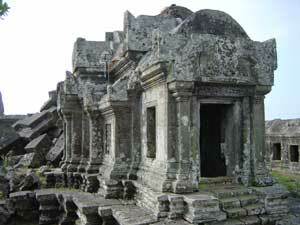 Preah Vihear Temple was built over the ninth to the twelfth century and juts out over the surrounding countryside on a cliff. We stay in Sre Eim , once a quite cross roads, now a bustling small town with numerous guest hosuesd and now a lux hotel . we can arrange a homestay if guest wish. Full day back to Siem Reap with numerous stops and detours. Back in Siem Reap before sunset and in good time for a celebration dinner and some refreshments. No problems. Great restaurant in Anlong Veng. Basic Khmer food available on the mountain. Small restaurant at Preah Vihear Temple market. This 3 day, 2 night 4WD adventure trip includes an experienced driver and 4WD air conditioned vehicle, (Monterro or Land Cruiser vehicle), all transport costs and transfers, refreshments in Hidden Cambodia base prior to and following the adventure tour, entry and tour of the Dangrek Escarpment and mountain to include Pol Pot’s 2 residences & bunker, cremation spot, location of trial, & Ta Mok’s residence and museum, entry into Prasat Preah Vihear, 2 nights accommodation in total in Anlong Veng and Preah Vihear, 2 breakfasts, 3 lunches, 2 dinners, water, snacks, road payments & levies, English speaking HC Guide, local guides where necessary, baggage handlers, additional military vehicles where required, any local fees such as road charges and toils, local and tourist police. Average travel per day of 5/6 hours, Prasat Bakan is quiet remote, very basic accommodation as well as Preah Vihear with regards to facilities but a once in a lifetime trip. Food good throughout. A taste of a glorious past in these two magnificent Angkorian complexes, an fantastic opportunity to visit remote villages, the lively provincial capital of Preah Vihear and a chance to gain greater insights in to the borders of Cambodia and the people who live there. Day 2: Visit the expansive water reservoir or on the other side of Ta Seng and Prasat Domri, the elephant temple. Tour to a number of other temples in the area. Depart Bakan for Tbang Meanchey. Through the small town of Svay and then on the new expansive but dug up road to Tbang Meanchey. Stunning scenery and forested land along this road. Great accommodation and choice of restaurants available in this lively capital town of Preah Vihear province. Opportunity to explore the market and some interesting local NGO projects. Depart for Anlong Veng. Enjoy an excellent lunch in Anlong Veng town before driving up the escarpment. Pol Pot lived here during his last years and died in his jungle hide out on the mountain in 1998. Tour of the mountain, Pol Pots grave and bunker and the remains of the house he was tried in, visit with local people, dinner and over night in a spectacular mountain camp in comfortable wooden bungalows. Following a Following a hearty breakfast and a tour of Ta Mok’s Villa in the town of Anlong Veng. Depart for Siem Reap with numerous stops and detours, notably Serai Noi, meaning Little Women, the half waypoint between Anlong and Siem Reap. Back in Siem Reap before sunset and in good time for a celebration refreshments. 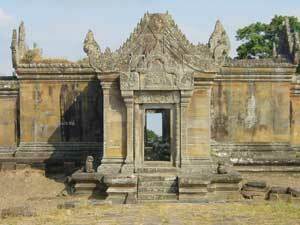 This 5 day, 4 night 4WD adventure trip includes an experienced driver and 4WD air conditioned vehicle, (Monterro or Land Cruiser vehicle), all transport costs and tranfers, refreshments in Hidden Cambodia base prior to and following the adventure tour, entry and tour of Prasat Bakan and surrounding temples, Preah Vihear temple, the Dangrek Escarpment and mountain including Pol Pot’s 2 residences & bunker, cremation spot, location of trial, & Ta Mok’s residence, entry into Prasat Preah Vihear, all overnight accommodation, 4 breakfasts, 5 lunches, 4 dinners, water, snacks, road payments & levies, English speaking HC Guide, local guides where necessary, baggage handlers, additional military vehicles where required, any local fees such as road charges and toils, local and tourist police, military and security escorts. Alcoholic beverages, soft drinks, laundry services, phone calls, and medical insurance. A taste of a glorious past in these two magnificent Angkorian complexes, a fantastic opportunity to visit remote villages, the remote village of Ta Seng and the people who live there. Koh ker has been opened greatly to allow visitors to understand this 10th century complex more fully. Depart SR and travel to Bakan via Stoung. Numerous stops along the road at small villages and turns in the road. Late afternoon arrival at the crossroads in Ta Seng Village to visit with locals. Travel 5km to visit this massive temple complex of Bakan. Sleep in a cabanna located inside the gates of Bakan Temple in hammocks with staff from the temples, a stunning location for a campfire or stay in a basic family wooden house in the Village of Ta Seng. Bathroom facilities at the homestay. All supplies send from HC base will allow for a fantastic barbeque dinner and breakfast in either location. Visit the Baray on the other side of Ta Seng and Prasat Domri. Depart Bakan for Koh Ker temple. Stay in either the small village of Seyang, just 5km for the temples in a small family house or Koh Ker Jungle Lodge, our won house in the village of Koh Ker . Our hosts, as do in all locations, welcomes Hidden Cambodia guests weekly. Tour of the main complex and surrounding temples at the rear with local officials on arrival or before departure, time allowing. Wander through the small village of Seyang in the evening prior to dinner and overnight. Possibility to stay closer to Koh Ker temple and the small village beside it. Tour of the small village and surrounding countryside of Koh Ker. New network of roads now allow access to newly uncovered and demined temples. 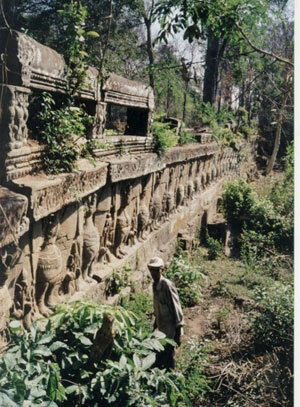 Depart for Svay Leu and the unusual relief carving found deep in a bamboo forest. Following lunch, guests visit Beng Melea temple or can have an informal stop at an alternative location, returning to HC Base for celebratory drinks. This 3 day, 2 night 4WD adventure trip includes an experienced driver and 4WD air conditioned vehicle, (Monterro or Land Cruiser vehicle), all transport costs, refreshments in Hidden Cambodia base prior to and following the adventure tour, entry and tour of Prasat Bakan and surrounding temples, Koh Ker, Beng Melea, Svay Leu unusual relief temples, 2 nights accommodation, 2 breakfasts, 3 lunches, 2 dinners, water, snacks, road payments & levies, English speaking HC Guide, local guides where necessary, baggage handlers, additional military vehicles where required, any local fees such as road charges and toils, local and tourist police, military and security escorts. Alcoholic beverages, soft drinks, laundry services, phone calls and medical insurance.